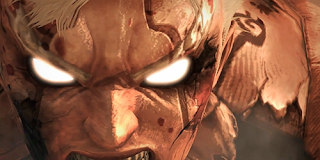 This week on PopMatters, I rage out with Asura's Wrath. Actually, there's not much to be angry about, as I liked the game quite a bit. I had been casually following Asura's Wrath up to its release, so I was surprised by the final product. I expected a more formulaic character-action style game in the mold of God of War. What I got was more like an interactive Dragonball Z show. The actual direct-control fighting isn't all that interesting compared to other games; you have a weak attack, a strong attack, and a handful of contextual moves. The game's quicktime events aren't all that challenging either. What's special is the framework in which all this happens. In a bizarre, yet highly-entertaining move, the game is presented episodically. We're talking full-on, Saturday morning cartoon style episodes here: intro credits for each chapter, episode previews, dramatic breaks right before a confrontation. It takes a little while to get used to, but I think it was ultimately a great design decision. The game is repetitive in multiple ways: combat is the same basic charge-to-special move every time. There are only so many possible QTE prompts. Even the sound effects and musical themes get reused regularly. In short, it's a lot like an episodic television show. Watch enough episodes of anything in a row and you'll quickly see familiar plot arcs, the same sets, and reused soundtracks. It's something that I hadn't thought about too much in the context of gaming, largely because even the most "episodic" games rarely span the length of a single TV season, let alone an entire series. Like many folks, I've all but abandoned broadcast TV at this point. If I watch a series, it's usually in a compressed timeframe made possible by Netflix. My game habits have followed this model for a long time. If I don't set aside a large chunk of time, I'm probably not going to play anything. Asura's Wrath reminded me that this method might sacrifice enjoyment for efficiency. Playing an episode every day or so helped me appreciate the game's structure and cadence. Suddenly, something that might have first like filler was a welcome ritual. I'm not sure I'll be able to serialize my play sessions when it comes to other games. Experiences like Far Cry 3 have a habit of lending themselves to marathons. Still it's a good thing to keep in mind when facing the prospect of devoting an entire day to a single game. Familiarity can breed contempt. In Asura's case, it would probably breed rage. That guy makes Kratos seem easy going. "Most JRPGs try to be a (long) movie, Persona 4 tries to be a TV series"
And then they went on to say that Persona is not the only game you are likely to be playing at the time, and they must expect you to drop off and come back, so the game is structured like a TV series which usually acknowledges you have a life between shows. A lot of JRPGs on the flipside, don't actually play as though they expect you to have spaces between your play much even if they try to suggest it with chapters and the like. I find this was a particularly interesting phenomena when I was doing a let's play for Link's Awakening recently, playing just 20 minutes a day for an episode gave it a very different feel, repeated ideas were there, but far less painful than you might otherwise expect. This kind of thing is I think why I like handheld gaming so much... It lends itself to short, regular sessions on commutes or while dinner is cooking but you need to stay in the kitchen to keep an eye on it or any number of things. That kind of play session lends itself to entirely different perceptions about what is good and bad. Funny, I have never actually "played" Persona 4, but I did watch Giant Bomb's entire endurance run (for some crazy reason). Following along in 30 minute to 1 hour chunks definitely fostered that "TV series" feeling. ... that's impressive... I honestly wouldn't think Persona would be all that interesting to watch. I guess most lets plays in general tend to promote the idea of game playing as a TV series even more so infact given most people do them weekly?